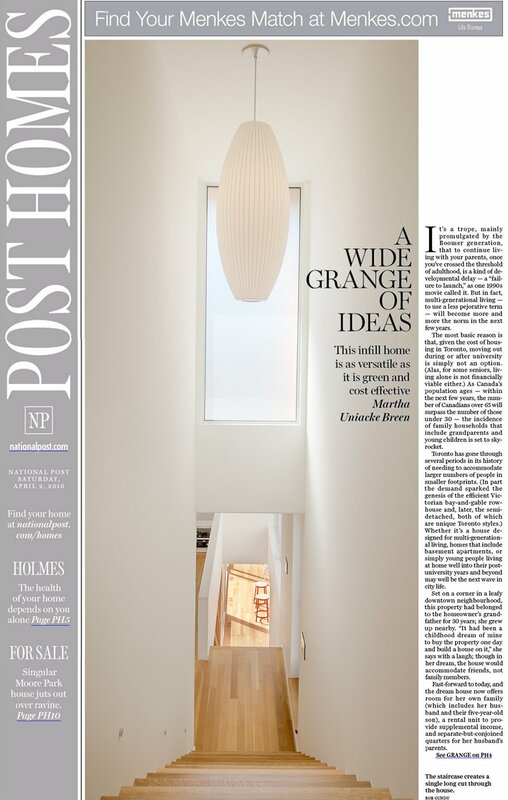 A Wide Grange of Ideas | Williamson Williamson Inc. Writer Martha Breen eloquently tells the story of the Grange Triple Double. The house is a contemporary contextualization of the site and neighborhood while at the same time, a forward thinking solution for the ‘sandwich generation,’ describing how a young family can accommodate the needs of both children and parents on an urban lot in downtown Toronto. “The house is dynamic both inside and out; it was designed so that it can be adapted as needs change.” The ground floor rental unit can be connected to the home’s living spaces if the grandparents require a fully accessible unit at grade. For the time being, they rather enjoy the view from the third floor with it’s large private deck! There are more images and the full article here or here.